Inevitably, as the first in a four part review, this piece will also indulge in a little scene-setting and some comments on the later parts of the story will surely be unavoidable. The other learned critics, in their sagacity, are of course welcome to question this writer’s interpretation of the evidence and set the record straight with their own spin on the story. After all, as someone who only vaguely remembers Peter Davison’s mud spattered end in ‘The Caves of Androzani’ and whose dreams are still haunted by glass Daleks and Brian Blessed’s eye shadow, is Robert Barton-Ancliffe even a reliable witness? He’s back. And it’s about teatime! Saturday, September 6th, 1986 saw the hotly anticipated return of Doctor Who from an unprecedented 18 month hiatus, or, depending who you believe, the very brink of cancellation. For casual and diehard fans alike, feelings were running high but the anticipation had been tempered by some unsettling tabloid rumours, fan community gossip and, in one case, very public criticism from BBC1 controller himself, Michael Grade. An epic, fourteen part story, spanning the entirety of series 23 of ‘Doctor Who’ ‘The Trial of a Time Lord’ was the perfect opportunity for series producer John Nathan-Turner to silence the critics and naysayers and present a ‘Doctor Who’ that fulfilled its boundless potential with a concept that, on paper, should have pushed the character and the format to their very limits. Episode one kicks off with a genuine treat for viewers. A sweeping motion controlled shot of a baroque, meticulously detailed space station, which slowly draws the TARDIS on board to new series composer Dominic Glynn’s foreboding yet modern score, cleverly interpolating the Cloister Bell chime. Much is made of this opening by fans and it is hard to deny that it’s a real step change in quality, more akin to the expensive Hollywood craft of ‘Star Wars’ and ‘Battlestar Galactica’, than the ‘string and black velvet backcloth’ approach of yore. As the story unfolds however, it becomes a little more problematic as, aside from setting the scene for the trial, it hardly serves the story. Despite the vague promise from the BBC of ‘bigger and better’, it’s clear from the look of the overall production that the budget for series 23 had, if anything, been reduced once more. Therefore, given the reported £9,000 spent on this shot alone, the expense seems hard to justify. Little further use is made of this shot during the series and, as The Doctor steps into a large but rather beige studio-bound courtroom, one can’t help but wish they had spent the money on set dressing, or a complete re-design, given how much of the series as a whole is spent within its bland walls. Some effort is made to conjure interesting angles and eke out the mystery with some sparing lighting in the opening shots but, once the lights go up, the limitations become clear. 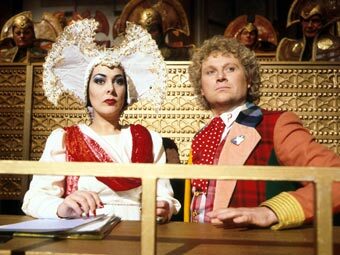 Thankfully, the key strength of the trial scenes is the well-cast triumvirate of principal actors, with Michael Jayston as court prosecutor The Valeyard and Lynda Bellingham as The Inqusior who join a rejuvenated Colin Baker who feels more comfortable in the role than ever. Jayston is an imposing presence, with cold eyes and a brilliantly resonant voice that exudes intelligence and menace without tipping over into pantomime villain stereotype as he spars with Colin Baker’s equally spirited Doctor. The pair bandy words wonderfully, clearly enjoying the exchanges, and are limited only in their relatively static positioning and a script that relies little too heavily on insults over legal word play, a sad oversight on the writer’s part given Baker’s own background in the legal profession. Lynda Bellingham as the Inquisitor is the consummate professional and brings a steely authority to a part that might have been merely a fulcrum, round which prosecutor and defendant revolve, whilst also adding a much needed undercurrent of sympathy. The costumes however are an odd assortment and, whilst Colin Baker’s garish attire needs no introduction, poor Jayston and Bellingham deserve just as much credit for maintaining their conviction and gravitas whilst coping with some truly questionable headgear, even considering that the Timelords are not known for their sartorial understatement. Story-wise, the idea of the Doctor being put on trial by the Timelords for breaking ‘The First Law’ has its precedents in Doctor Who dating back to 1969’s ‘The War Games’ but, where the final episode of that serial acted as a brilliant ‘out of leftfield’ climax to six years of adventuring, the new trial is risky move into ‘meta’ storytelling, with The Doctor forced to watch and comment on his own adventures, thus reflecting the wider media debate around the series’ future. It might have been more beneficial to concentrate simply on the overall quality and story planning, however it does at least try to put forward something new. 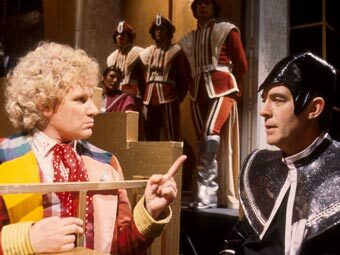 One often has the impression, with the first adventure ‘The Mysterious Planet’ at least, that the writers perhaps struggled to create new stories around which the framing scenes of the trial would fit without worrying too much about blending the two narratives together more seamlessly. 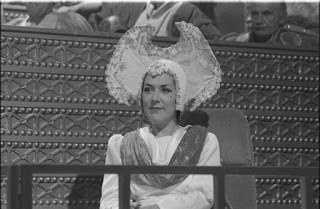 That’s not to say that the court scenes don’t occasionally blend well with the main story of ‘The Mysterious Planet’ but there’s nothing in that story to really suggest why it has been singled out as a damning piece of evidence that might force the Doctor to answer with his life any more so than the previous series 22’s ‘Vengeance on Varos’ or ‘Revelation of The Daleks’ might have. Despite this, ‘The Mysterious Planet’ ‘A’ story is in itself a fun enough romp and it has much of interest, with a solid enough science fiction mystery at its core, and a host of memorable characters. The script, sadly the last completed contribution from series legend Robert Holmes, has moments of genuine wit and the jokes hit the mark more often than not. The plot, involving a primitive human society enslaved by machines is oft compared to Holmes’ earlier and rather silly ‘The Krotons’, but it does also homage other more ‘classic’ sci-fi fayre such as ‘Beneath the Planet of the Apes’ (1970) and H.G. Wells’ ‘The Time Machine’. The main problem here, as with the trial setting, is simply one of money. 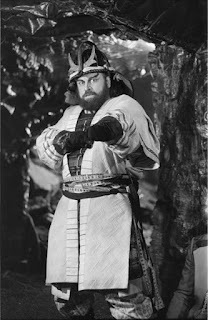 The outdoor setting is pleasant and green, and is at least a little varied, but when the plot starts to move and ‘hordes’ of primitive tribespeople storm off to battle, it’s hard not to see it for what it is, a half dozen haphazardly costumed extras jogging into a slightly damp forest. The interior sets of the underground are solid, if unspectacular, but the bright lighting largely washes away any atmosphere that might have been gleaned here. Also, the limitations of the supposedly deadly M-5 robot are all too apparent, as it exudes about as much menace as a road sweeper, and a slightly slow one at that. As with the trial scenes, the real saving grace here is the performances. First and foremost, the principal duo of Colin Baker’s Doctor and Nicola Bryant as Peri are a marvellous revelation after a screen relationship that had often been written as openly hostile and they are now more akin to old friends who, while still prone to bickering, are nevertheless very comfortable with one another. The characterisation of the Doctor, while no less brash and excitable, is injected with warmth and a knowing charm by Baker and this is returned wonderfully by Bryant. It is clear that the pair put in a lot of thought into their screen friendship and the results are a joy to behold, however fleetingly. Bryant is largely served well by the script and isn’t over reliant on the Doctor here. The wardrobe makeover is a welcome one, as she is at last allowed to wear sensible clothing however, given that there is at least a passing reference to impending sexual slavery here, and what lies in store for the character further down the line with ‘Mindwarp’, there is clearly still a long way to go for the overall treatment of women in Doctor Who. The supporting players also step up to the mark in fine style and, while Michael Jayston’s Valeyard looms large even when not on screen, Tony Selby’s debut turn as intergalactic conman Sabalom Glitz is a welcome shot of levity and roguish charm and his interplay with partner Dibber, played by Glen Murphy, overcome the limitations of the production to produce one of the series' more memorable double acts. 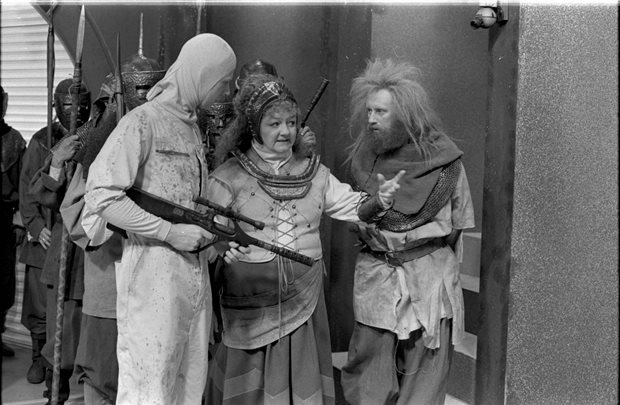 Joan Sims, as warrior queen Katryca is a case of casting against type, with a fine, understated performance that is only undermined if one has fond (or otherwise) memories of the ‘Carry On’ films, exacerbated no end by the overall tone of the production, which is slightly more camp than the writer himself might have envisaged. 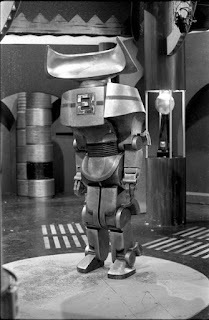 The same applies to the robot Drathro, the realisation of which, while cleverly constructed, is a little too close to Marvin the Paranoid Android. Dispensing with the robot and giving the character a more cerebral, disembodied presence might well have made better use of Roger Brierley’s spirited voice work that manages to sound robotic but animated enough to be a convincing villain. The two guest performances that really shine here though are Adam Blackwood’s naïve Balazar and Tom Chadbon’s more cynical Merdeen. The pair inject a real sense of pathos and, by the story’s end, have proved themselves more than worthy of our sympathy and the Doctor’s risks on their behalf. Overall, this story is fine as series openers go. We see a re-invigorated central duo, who tackle a new threat in fine style, accompanied by an assortment of colourful characters, all of whom are played with far more conviction and style than the campy tone of the visuals suggests. The limitations of the production budget are sadly obvious and the trial structure can be a little superfluous for anyone who prefers their Doctor Who simple and undemanding. The trial does, however, have three towering central performances and sets up an intriguing mystery that carries devoted viewer’s interest well into the next story. The trial of The Trial of a Timelord will continue after a short recess, on 25th October. Court is adjourned until then.